We are aware of a known limit (bug?) of the official Google Drive API. 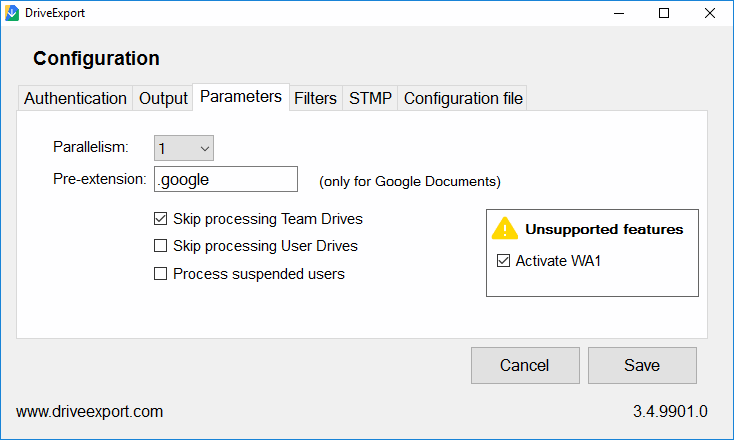 It is not possible to export Google native items – such as documents, spreadsheet and presentations – which are greater than 10 MB. Recently, we discovered a different way to export google documents using an export API used by Google Drive web-site and not by the official API. It allows to export files greater than 10 MB! The new version of DriveExport – 3.5 currently in Beta – uses the new API as a workaround in case of error 403 – ExportSizeLimitExceeded. Very important: keep in mind that the workaround is not officially supported and the underlying API could be discontinued or modified without notice by Google, making the workaround ineffective. You agree that you use it at your own risk. We published DriveExport 3.5 BETA 4. Now DriveExport verifies the MD5 hash of every “binary” files it manages, both during the download phase from Google services or during verification in the following runs. This guarantees that local files are the exact copy of the original files on Google servers. Native Google documents (Documents, Sheets, Presentations, etc.) cannot be verified because Google does not give the MD5 hash. The new BETA also introduces many performance improvements, reducing in particular the time required by DriveExport to synchronize.